"He's up past his bedtime in the city that never sleeps." Home Alone 2: Lost in New York is about a young boy's adventures in New York City and the lessons he learns about self-reliance. Kevin McCallister had been accidentally left home alone for several days the previous Christmas when his family flew to Paris. This time, his family is prepared to fly to Miami for the holidays. Kevin is not particularly excited to go to Florida because he feels that the climate is too warm to be an appropriate Christmas destination. On the day of the trip, the family oversleeps and has to make a mad dash to the airport. This year, Kevin actually makes it to the airport with his family, but gets on the wrong flight. While his family heads to Florida, Kevin is on a flight to New York City. Because of his previous experience of being left alone, Kevin knows that he has to take action to keep himself safe. He manages to check into a nice hotel by using one of his father's credit cards. Kevin's parents find out that Kevin is in New York through the credit card company. When the hotel confronts Kevin about the use of the credit card, Kevin decides to flee the hotel. When walking around the city, Kevin is spotted by Harry Lyme and Marv Merchants, a pair of fugitives that tried to break into Kevin's home the previous Christmas. Harry and Marv have plans to get back at Kevin, who got them arrested and sent to prison. Kevin learns that the pair has broken out of jail and is coming for him, so he sets another trap for the crooks. Meanwhile, Kevin's mom makes it to New York just in time to be reunited with her son at Christmas. Home Alone 2 concentrates on the idea of making the best out of a bad situation. As Kevin learns key skills to help him survive on his own, he knows that he still needs the love of his family. 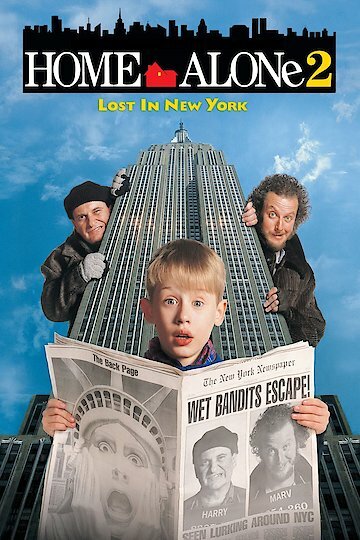 Home Alone 2: Lost in New York is currently available to watch and stream, buy on demand at Amazon, Vudu, FandangoNow, iTunes, YouTube VOD online.